Croydon can be a difficult place to learn to drive. In fact, the average pass rate for learner drivers in Croydon is significantly lower than the average pass rate for the rest of the country. Less than 39% of learner drivers in Croydon pass their driving test on their first attempt, compared to the national average of 43%. Croydon is densely populated and the roads are heavily congested. There is often a lot of traffic and roads are made narrower and harder to navigate because of parked cars that line most of the streets. However, with a bit of know-how, a learner driver can easily learn how to drive in Croydon. In some cases, the complex and busy roads can help you become a better driver. They teach you how to stay calm under pressure and manoeuvre a vehicle accurately and safely. However, Croydon’s most congested roads shouldn’t be driven on until you have gained some experience in handling a vehicle. 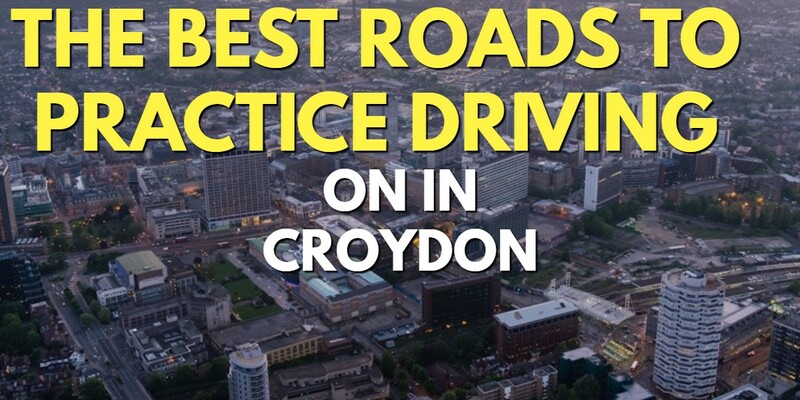 So, where can a nervous learner driver find roads to practice driving on in Croydon? Here we have a run through of some of the quieter roads in Croydon you can use to practice manoeuvres on. Before we look at some of Croydon’s most learner-friendly roads, it’s important to mention the merits of public car parks. A quiet car park – say, a supermarket car park after 4pm – can be a very good place for a learner driver to get the feel of being behind the wheel. There is a lot of empty space, few vehicles and even fewer pedestrians to worry about. If there isn’t a quiet parking lot available, look for a nearby industrial estate. This is a quiet road and learners can practice driving without the threat of oncoming traffic. However, there can be a lot of parked cars along the streets here that nervous learners may struggle with. This dead-end street means that learners can concentrate on practicing manoeuvres without worrying about oncoming traffic. The road is fenced in with no houses so this is a useful place to practice reversing to the left and a turn in the road. This is a large, spacious road good for practicing parallel parking. This road leads to Selsdon and offers a long stretch of road for learners to get the feel of driving on without lots of stopping and starting or unyielding traffic conditions. The slight incline on this road offers good control practice and a learner driver can use this space to perfect pulling away and stopping a vehicle.